As part of her ongoing Diamond Jubilee Tour, Queen Elizabeth — the first queen ever to earn the unofficial epithet "Ninja Queen" — quietly snuck into the wedding of commoners John and Francis Canning at the Manchester Town Hall on Friday. In order to make the vow exchange as anticlimactic for the guests as possible, the Queen slipped into the room after the Cannings were united in overshadowed matrimony, royally blessing the union and looking all set for spring in a carnation-colored outfit. The bride, 44-year-old salon owner Francis Canning, was hardly upset that the Queen upstaged her on — fingers crossed, Mr. and Mrs. Canning! — her only wedding day because Elizabeth offered her a few generic well-wishes. "The Queen spoke to us by our first names," said Canning. "She said I looked lovely and she wanted to wish us all the best for the future." All the best...and a hex on the marriage! Or so the Queen added according to a rumor I'm starting right now. The Cannings, though assuredly thrilled to have their anachronistic religious ceremony attended by royalty, had learned before their wedding that the Queen had planned a stop to the Manchester Town Hall on the same time as their ceremony. According to the Manchester Evening News, the couple dashed off a whimsical letter to Buckingham Palace inviting the Queen to their party (Queen Elizabeth wasted on a wedding dance floor? ), though a polite reply from one of the Queen's ladies-in-waiting tempered the Cannings' hopes that the Queen would actually appear at the wedding, hopes that remained tempered until Queen Elizabeth skittered in a pink blur into the room, hand outstretched to meet the newly-wedded couple. 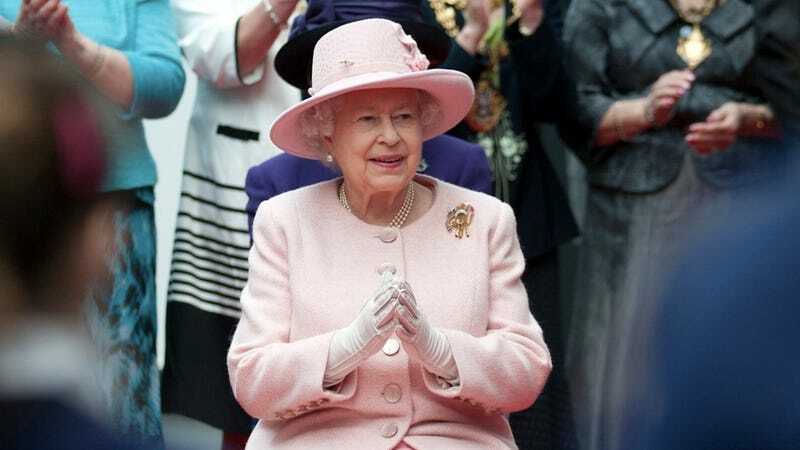 Though each guest underwent security checks, nobody was able to suss out the Queen's deft hand in all the preliminary hubbub. Nobody that is except the couple's friend and not-movie-director Peter Jackson, whose powers of deduction proved a little keener than the rest of the gawking wedding party. "We had to have security checks in advance. So we knew that she was going to be there. But we thought we would be kept well away from the reception." Sure, Pete — I'll bet you knew that Bruce Willis was dead the whole time too.